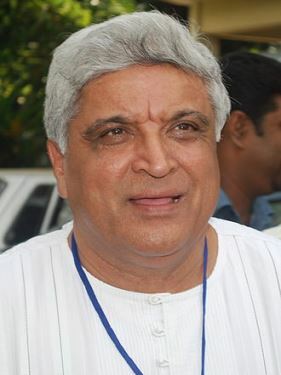 Javed Akhtar was born on 17 January 1945. He is an Indian poet, lyricist and screenwriter. Akhtar is a mainstream writer and some of his most successful work was carried out with Salim Khan as half of the script-writing duo credited as Salim-Javed between 1971 and 1982. He is a recipient of the Padma Shri (1999), Padma Bhushan (2007), the Sahitya Akademi Award as well as five National Film Awards. 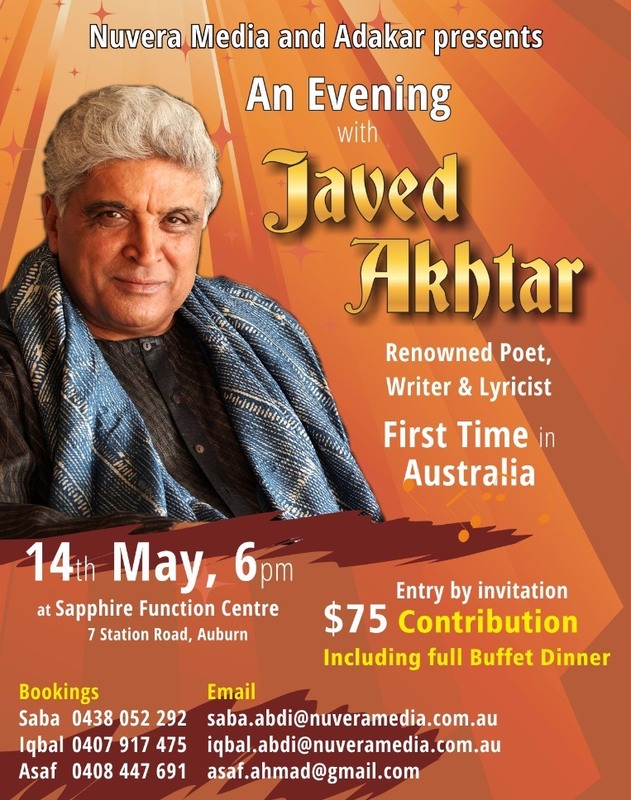 Javed Akhtar was born in 1945 in Gwalior.His father Jan Nisar Akhtar was a Bollywood film songwriter and Urdu poet, and his mother Safia Akhtar was a singer, teacher and writer. His grandfather Muztar Khairabadi was a poet as was his grandfather's elder brother, Bismil Khairabadi, while his great great grandfather, Fazl-e-Haq Khairabadi, was a scholar of Islamic studies and theology and played an important role in the First Independence Movement of India in 1857. Javed Akhtar's original name was Jadoo, taken from a line in a poem written by his father: "Lamha, lamha kisi jadoo ka fasana hoga". He was given the official name of Javed since it was the closest to the word jadoo. He spent most of his childhood and was schooled in Lucknow. He graduated from Saifiya College in Bhopal. Initially in the 1970s there was no concept of having the same writer for the screenplay, story and dialogue nor were the writers given any credits in the title. Rajesh Khanna is credited with giving Salim Khan and Javed Akhtar their first chance to become screenplay writers by offering them work in Haathi Mere Saathi. Javed Akhtar accepted in an interview that "One day, he went to Salimsaab and said that Mr. Devar had given him a huge signing amount with which he could complete the payment for his bungalow Aashirwad. But the film was a remake and the script of the original was far from being satisfactory. He told us that if we could set right the script, he would make sure we got both money and credit." Salim-Javed were hired by G. P. Sippy's Sippy Films as resident screenwriters and produced the screenplays for successful films like Andaz, Seeta Aur Geeta, Sholay and Don. Their first big success was the script for Andaz, followed by Adhikar (1971), Haathi Mere Saathi andSeeta Aur Geeta (1972). They also had hits in Yaadon Ki Baaraat (1973), Zanjeer (1973), Haath Ki Safai (1974), Deewaar (1975), Sholay (1975), Chacha Bhatija (1977), Don (1978), Trishul (1978), Dostana (1980), Kranti (1981), Zamana (1985) and Mr. India (1987). They have worked together in 24 films including two Kannada films – Premada Kanike and Raja Nanna Raja. Of the 24 films they wrote 20 were hits. The scripts they wrote but which were not successful at box office include Aakhri Dao (1975), Immaan Dharam (1977), Kaala Patthar (1979) and Shaan (1980). Though they split in 1982, due to ego issues, some of the scripts they wrote were made into hit films later like Zamana and Mr. India. Salim-Javed, many a time described as "the most successful scriptwriters of all-time", are also noted to be the first scriptwriters in Indian cinema to achieve star status. Akhtar was nominated to the Parliament upper house Rajya Sabha on 16 November 2009. Akhthar was awarded the civilian honour of Padma Shri by the Government of India in 1999, followed by the Padma Bhushan in 2007. In 2013, he received the Sahitya Akademi Award in Urdu, India's second highest literary honour, for his poetry collection Lava. Akhtar was a Muslim but later became Atheist.He has brought up his children Farhan and Zoya Akhtar also as atheists.Akhtar was married to Honey Irani, with whom he had two children, Farhan Akhtar and Zoya Akhtar, both film directors and actors. The father-and-son duo have worked together in films such as Dil Chahta Hai, Lakshya, Rock On!! and Zindagi Na Milegi Dobara with Zoya. Farhan was married to Adhuna Akhtar, a hair stylist. Javed divorced Irani and later married Shabana Azmi, the daughter of eminent Urdu poet, Kaifi Azmi.